Our parents’ generation had no time to pursue happiness. They were too busy saving the world. But the blood, sweat and tears sacrificed by “the greatest generation” in saving the world wound up making them happy, too. Their offspring — a generation that has bled less blood, perspired less perspiration and shed fewer tears than any generation in history — perceive “happiness” differently. They see happiness not as the incidental effect of a life lived well. For them, it’s the whole purpose of life. “Happiness” is all we want. Our parents became happy by being great. We, in contrast, think we can become great by being happy. So are we happy yet? No. Studies show that people pursuing happiness tend to be less happy, not more. They are more likely to abuse drugs and alcohol. Most ominously, they also tend to be less kind and less generous. Our parents were happier saving the world than we are in pursuing happiness. It’s not surprising when you think about it. Underachievers who just want to be happy rather than achieve goals wind up underachieving in their goal of being happy. So what happened to our happiness? You must choose between two paths. The first path is the comfort that passes for happiness. Look for it in a shiny sunset, casual relationships and a job with lots of vacation time. When that fails to make you happy, sedate yourself with legal, illegal or recently legalized drugs. The elites will help you. Their power depends on the people not being cognitive of their failure. On this first path, people are without hope — and without the flip side of disappointment — because life is without meaning. Nothing holds the world up; it’s just bread and circuses all the way down. You’re a blob of cells, there’s no such thing as right and wrong and truth is relative. So pass the pipe and party on, dude. The other path is the less-traveled one of my parents’ generation. It starts when you lift your gaze up from your navel. You discover that there’s a world out there. In that world, there are people to serve and ideas to consider. There is truth that is objective and reality that is not relative. There is right and there is wrong. There is good and there is evil. If you lift your gaze even higher, you might see even more. What you see when you look up — or maybe just the act of looking up — may stir something buried in your happiness-pursuing blob of cells. It’s something undomesticated and uncontrollable. It’s something of wild abandon and reckless love. It’s your soul. And it wants to create something bigger than you. It wants to achieve. In those achievements, your soul will live forever. Well, Jefferson was a great man but also complicated and flawed. 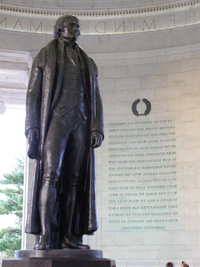 His excellent pursuit of life and liberty gave birth to a free nation. But his raw pursuit of happiness gave birth to illegitimate children with a woman whom he owned as a slave. It so haunted him that he freed his enslaved children, but not until they were adults. He went to his grave knowing that his children had spent their childhood as his slaves. That knowledge could not have made the great man happy. By looking outside yourself, you might achieve happiness inside in the only way that really works — by accident. Upbeats — Aspen election: In the recent City Council runoff election here in Aspen, one of the two candidates was a former mayor and longtime politician. He was endorsed by both newspapers, two other former mayors, the current mayor, a county commissioner, at least five past and present City Council members, a state representative, two sheriffs, the head of the Pitkin County Democrats (yes, that’s a redundant name) and a rabbi. He was trounced. Aspen, I love you. This entry was posted in Uncategorized and tagged aspen election, happiness, Jefferson, liberty, Life by onthebeatontrack. Bookmark the permalink.